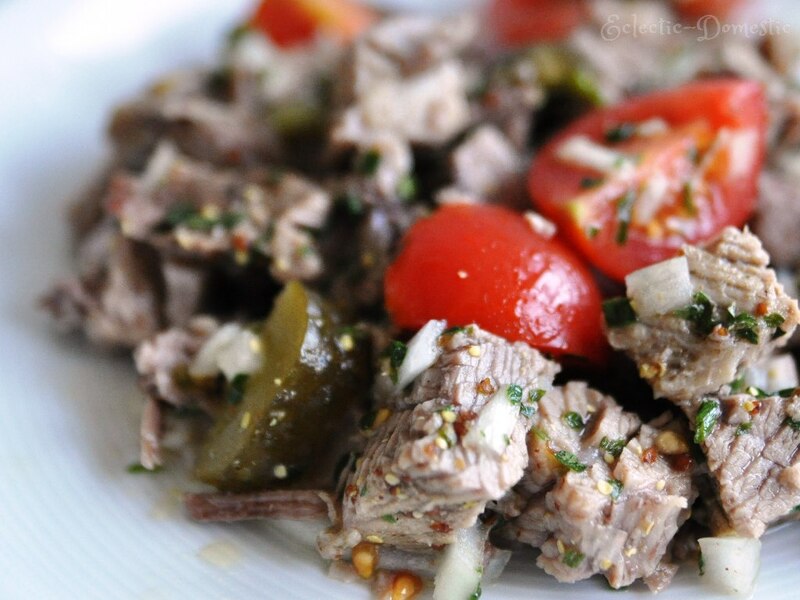 Here in Switzerland, I have discovered a delicious cold beef salad dish called Siedfleischsalat or “stewed meat” salad. 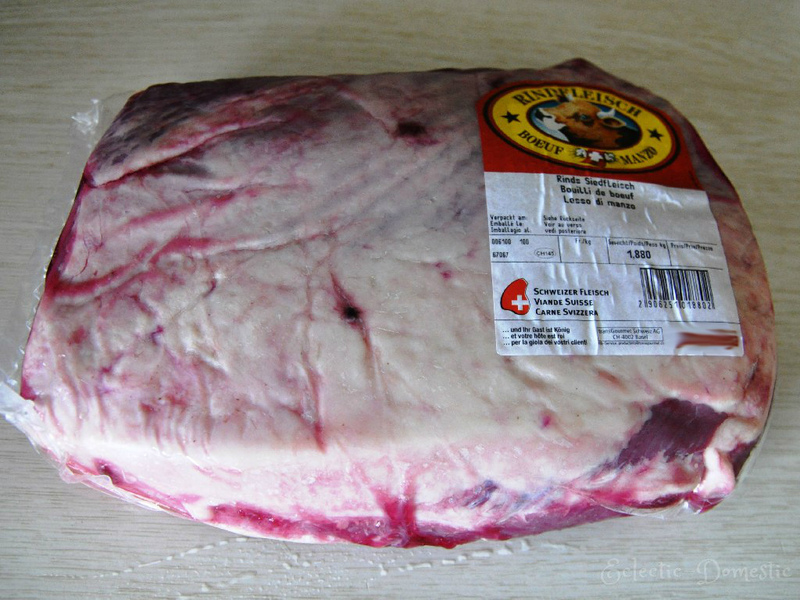 Siedfleisch translates roughly as “stewing meat” or “simmering meat.” It is basically beef stewing or soup meat and is sold as a large slab. To make the salad, the meat is simmered and then combined with seasonings and other ingredients then served chilled. I ate a delicious Siedfleischsalat the other day and so I decided to try to recreate it myself. I started with about 1.9 kg (ca. 4 lbs 3 oz) of stewing meat. I listed this amount in the recipe below. If you’re starting with less meat, you can scale the ingredients accordingly. Here’s a great online recipe converter I just found out about. As you can see, though, the meat was very fatty, so I ended up trimming nearly 400g (14 oz.—nearly a pound!) of fat. Be sure to trim well for visible fat. I cooked the meat in broth and then diced it. Once it had cooled, I combined it with the other ingredients and tossed it with the dressing. Mmmmmmm! En guete ! (Bon Appetit in Swiss German.) Please let me know if you make it. Great summer salad because you can make it in your slow cooker. In my opinion, it's even better the next day. 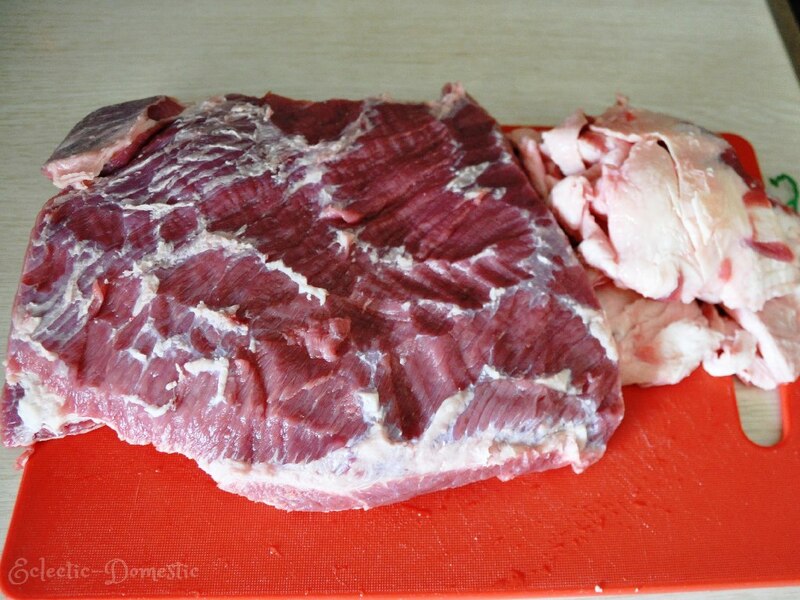 Trim the beef of visible fat. Place meat in slow cooker or a large pot. Cover with stock, broth, or water. Cook on low for 4-5 hours. If using a stovetop, bring to a boil then reduce heat and simmer for 1 hour. In the meantime, whisk together the ingredients for the dressing and set aside. When the meat is tender, let it cool, then dice or slice thinly. Combine in a bowl with the remaining salad ingredients and toss with the dressing. The amounts in this recipe are subject to taste. You can also add red pepper, green pepper, mushrooms, or whatever else you have on hand. Tip: Let meat cool, then freeze slightly to make cutting easier—especially if you want thin slices.